Welcome Golfers and Guadalupe River lovers to The Bandit on Lake McQueeney. We list all SABOR MLS properties on our website, Bandit Golf Course homes for sale, the Lodges at Bandit Golf Club Condos for sale as well as Bandit Golf Course Lots for sale. Select your favorites then call us to view. The Bandit Golf Club will test the best of golfers. The course winds in and around Long Creek and Lake McQueeney. The Bandit's character comes from tremendous elevation changes, plenty of water and bunkers, lush fairways and fast and undulating greens. Some holes are quite scenic. The bunkers are well placed amongst the trees. Our Realtors at Mission Realty will help you find a New Braunfels home for sale near the Bandit Golf Club. 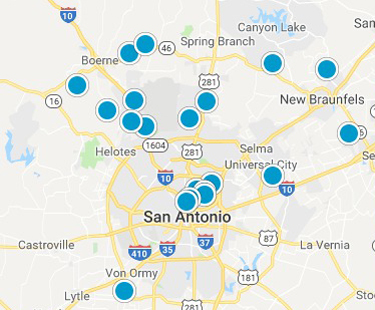 Realty United can show and sell any New Braunfels Home for Sale listing on the San Antonio MLS, regardless of which real estate agency's sign is in the yard. Only 30 minutes to San Antonio, plus, its easy access to Austin and Houston make it a grand place to meet and play family, friend and business associates in New Braunfuls.